What is the difference between martial arts and self-defense? What is the best way to protect myself? What is the best self-defense system? Can I learn what I need to know from books and videos? Do I have to practice a lot to be effective? What about carrying a weapon like a gun or knife? Why is ARCS a good system? Won’t the police protect me? Why do you advocate violence? What is ARCS Krav Maga? How is ARCS Krav Maga different from traditional martial arts? How much does an ARCS Krav Maga membership cost? Krav Maga intimidates me, but I’m still interested. What should I do? Does ARCS Krav Maga have a ranking system? With what school of Krav Maga is ARCS Krav Maga affiliated? If I’m a beginner is there a separate class for me or are all levels in the same ARCS Krav Maga classes? Do I need to be in shape to do ARCS Krav Maga? What is a typical ARCS Krav Maga class like? Do I need any martial arts experience? What’s the difference between the ARCS Krav Maga classes and the military hand to hand combatives training? The text book definition of “self defense” is the protection of oneself, possessions, or home against violence or threatened violence with whatever force or means are reasonably necessary. However, to keep a you in the right mindset I prefer to use the terms “self survival” or “self preservation” rather than “self defense”. Self preservation/survival is roughly 90% mental attitude and situational awareness, with the remaining 10% being physical combative techniques. What is the difference between “martial arts program” and “self-defense program”? Most martial arts today are just that, “arts”. They are used as a “competitive sport”. They are loaded with cultural traditions and focused on the perfection of “the art”. Martial arts heavily emphasize “forms” or “kata” (the memorization of a sequence of techniques that must be performed like a dance in a specific order while focusing on perfect execution of each technique). After several years of study “a martial art” may be effectively used to protect yourself, but most people do not have the time and self discipline required to learn “an art” and then effective be able to transition it for use it in a “self defense situation”. A “self-defense program” emphasizes situational awareness, de-escalation techniques, and then if necessary the physical means to neutralize the attacker and escape. You should try to avoid systems that have conflicting philosophies to the same problem, or attack. Make sure the system you choose is geared to what is “likely to happen” in your environment, and then trust your intuition on the best ‘fit’ to your temperament. ARCS is so successful because it focuses on the most commonly seen situations and attacks, and then it uses your built in reflex responses as a bridge into your physical self survival techniques. The ARCS program is taught first through video. You can easily learn the mental and situational aspects of self survival through just watching our videos, but after watching the the physical techniques they must be practiced with a partner. Revisiting the videos frequently will reinforce your training and keep you engaged in your training. The next step that should be considered, after establishing a good base with the videos, is making plans to attend one of our in-house 3 day seminars (24 hours of training) where you can take things to the next level and really pick the brains of our instructors. Not necessarily, but you need enough practice for the techniques to become an automatic in response to an attack. The ARCS program focuses on using your existing reflexes to your advantage so it drastically reduces the learning curve over many of the programs out there. In practice you and your partner need to make the training realistic and make each time count. Remember, perfect practice leads to perfect execution and you will need quite a few repetitions to actually use these techniques under stress. After you can easily perform the techniques without thinking too much, then spend a little time every couple weeks to maintain your skills. Obviously, the more you practice the better your techniques will be. A weapon is only effective if you have it on you, can draw it quickly, and you are completely prepared to use it. By carrying a weapon you are potentially introducing that weapon into a dangerous situation (the attack) where it may be used against you if you lose it during the attack, or worse yet if in that very moment you find that you are morally conflicted and unable to use that weapon against another human being. For many people, weapons are not a daily necessity or even recommended due to the risks and training involved. 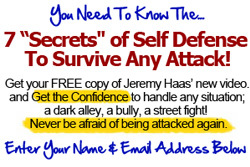 The founder of the ARCS System, Jeremy Haas, has almost 30 years of training and experience. He has studied Karate, Jujutsu, Judo, Western Boxing and he has studied the top Israeli military defense systems such as Krav Maga and Hisardut. In his military and police work he has survived several hand-to-hand and armed encounters. He has a REALISTIC sense of what is effective in life or death situations. He has also spent a vast amount of time and money in the study of human anatomy and physiology to ensure that the startle reflex responses and follow up techniques taught in the ARCS program are used with the utmost effectiveness against the natural weak points on the human body. No other systems can claim that! If you are involved in a conflict, the police usually will respond after the fact unless a cop just happens to be seconds away when you make the call for help, and that is assuming that you even had time to call 911 in the seconds prior to the attack. Your self defense and survival needs are almost always immediate and you should be proactive about acquiring those skills that will buy you the time and space to call for help. The world can be a cruel and violent place and the only way to survive is to be tougher than the situations that you are faced with. Violence is a tool that “bad guys” use to intimidate or physically overwhelm a victim. We must be able to use our self survival tools, one of which is controlled violence, to survive a truly violent encounter. Think of it as a military strategist would, nobody wants to go to war but when you have no choice you need to be tougher and better prepared then your enemy. So, when my safety or the safety of my loved ones is threatened, it is my duty to respond in a manner necessary to preserve my life and the lives of those around me. In other words, while I hate violence and fighting, I REFUSE TO BE A VICTIM of the whims of a criminal. Krav Maga is the official defensive tactics/self-defense system for the Israeli Defense Forces and hundreds of Elite US military and Law enforcement agencies. Automatic Reflex Combat Systems Krav Maga, or ARCS Krav Maga for short, takes “standard Krav Maga” to the next level by teaching you the same effective Krav Maga techniques, BUT most importantly how to use your natural reflexes (also referred to as Startle-Flinch Reflex) as a bridge into your learned techniques. This is extremely important since most fights are won or lost in the first few critical seconds! ARCS Krav Maga is not another self-defense system based on traditional martial arts approaches. It is a modern, reality-based method of training characterized by coherent and logical techniques that build up easily and naturally, featuring simple movements of the human body. Because the ARCS Krav Maga system is well integrated, common defensive principles apply to a variety of attack scenarios. Thus, the system can be learned in a relatively short period of instruction. The techniques are easy to retain and can be performed under stress. We have ARCS Krav Maga memberships that range from $19.99 all the way to $149 per month. The type of membership that you get will depend on your needs and interests. We do our best to be flexible and work with people on an individual case-by-case basis. Making our community safer is our goal, and we believe that providing ARCS Krav Maga training is the best way to achieve it. We will go out of our way to find a membership that works for you in order to meet that goal. When you come in for your free trial class, someone will be available to meet with you to tailor a membership to your individual needs. ARCS Krav Maga is designed to take adults with little, or no previous experience, and bring them to a high level, very quickly. Each and every technique is demonstrated, practiced, and then performed live with constant observation and correction by our Certified ARCS Krav Maga instructors. To see if ARCS Krav Maga is right for you, try a free class. We believe that it will become obvious, after just 1 class, that training in ARCS Krav Maga will quickly train you to effectively defend yourself and/or your loved ones. You will also see how ARCS Krav Maga training will put you into the best shape of your life, while learning practical, applicable self-defense techniques. Yes, Krav Maga has five levels with corresponding shirt colors. Students start in Level 1 classes as a Gray Shirt beginner; higher ranks are earned in the following order: Gray, Green, Sand, Red, and Black. To advance to the next level, students must go through an examination to verify competency in each level’s techniques. My Krav Maga training came direct from Israeli IDF trainers and I have never concerned myself with all the politics and organizations involved with Krav Maga. Generally the organizations that govern any style (Krav Maga included) are in it for the money or for egos/bragging rights of the instructors, which usually seems to come back around to money in the end. I refuse to pay any organization for a piece of paper that gives me permission to teach what I have learned to people who truly need it. I try to keep all levels in class together and just push my advanced students a little harder. That way, you as a beginner, will always have other people at various stages of training around you. This will allow you to see them performing techniques and help you to model your movements after them. Give it a try, you will not be disappointed! ARCS Krav Maga gets you into fighting shape! Designed by a team of top fitness experts and defensive tactics instructors known for building fighters, ARCS Krav Maga programs use cardio classes, bag work, and sports conditioning techniques to burn fat and tone muscle, typically burning 600-800 calories in a 1.5 – 2 hour class. Our class format is created to allow trainees of different fitness levels to fully participate to the best of each individual’s ability. We have collegiate athletes working out alongside grandparents, each leaving equally exhausted, having been pushed to their respective limits a few times each training session. Because we use natural movements and a combination of aerobic and anaerobic training, the human body responds to consistent training by creating strong lean muscle and eliminating excess weight. As an adult program, we are able to accommodate de-conditioned men and women. Many of our trainees come in with bad knees, backs, necks, etc., or other previous injuries. The need for self-defense is equally, if not more, important for those with people. We welcome the opportunity to show you how much you can still accomplish in terms of physical fitness and self-defense. Our goal is to make every individual safer, regardless of their circumstances or abilities. We have trained people of all ranges of cognitive or physical abilities. Our instructors are all trained to modify the techniques and drills to every person’s ability level. Training twice weekly is frequent enough to improve conditioning and retain techniques. The more you train, the faster you will learn and improve. Remember that ARCS Krav Maga, or any self-defense training for that matter, is a perishable skill. Consistency over time is much more useful than packing in a bunch of classes in your first month. We will start with a 15-20 minute stretching and warm ups to elevate your heart rate, pump blood into your muscles, and prepare your body for the work to come. Most new trainees will find themselves looking at the clock about 5 minutes in, and wondering what they’ve gotten themselves into. Then we will let you catch your breath and hydrate. Next, we will do 45-60 minutes of combatives training on upper and lower body strikes (punches, kicks, knees, and elbows). Throughout this portion of class we will demonstrate and teach the techniques, lead you through some practice work, and then let you practice live to pads, heavy bags, etc. We will do different drills to train speed and accuracy, and improve endurance. The last part of class is devoted to self-defense techniques. Again, we will demonstrate the techniques, take you through a series of practice stages, and let you practice with live partners. The class usually culminates in a stress drill where you will practice your newly learned techniques while under stress in order to develop your aggression and fighting spirit. ARCS Krav Maga is designed to take adults with little, or no previous experience, and bring them to a high level very quickly. Each and every technique is demonstrated, practiced, and then performed live with constant observation and correction by our Certified ARCS Krav Maga instructors. ARCS Krav Maga certified Instructors have trained over one thousand Soldiers, Sailors, Marines, and Airmen, in Krav Maga Combatives, preparing them for deployment. ARCS Krav Maga & Combatives is also the training ground for Defensive Tactics Instructors from local, state, and federal law enforcement agencies. You are in very good hands when training at ARCS Krav Maga & Combatives! There is very little difference, and truth be told ARCS Krav Maga & Combatives stays on the cutting edge of this type of training. Almost all of veterans and law enforcement officers I encounter, frequently express how much they wish they could receive the type of training that we offer. The biggest difference comes in the finish. While civilians should run from danger and disengage as soon as a safe opportunity to do so presents itself; Police and Military personnel must run toward the danger. Police and Military personnel have the objective of gaining safe control of the situation, and the option of going to higher force options when necessary. Therefore, the endings are different, with police and military learning to safely search, and take custody. These specialists are also trained to retain their weapons while fighting and to consider use of force issues when engaging.